I have to say I enjoyed this one. The holidays come with their emotional baggage, but are usually a good time. Well, onto the pics! Tis The Season… for hot soup! Our loaded potato soup, specifically. 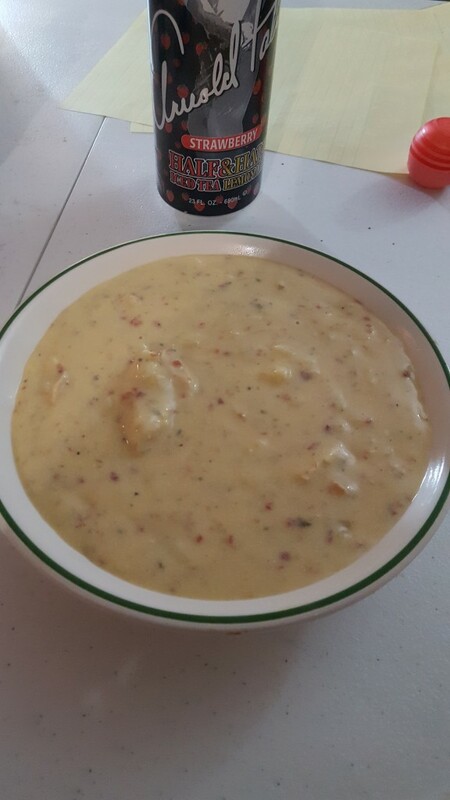 We start with a potato soup base and add cheddar, bacon bits and grilled chicken chunks. So. Insanely. Good. Also featured? My FAVE iced tea.. Strawberry Half & Half. YUM! 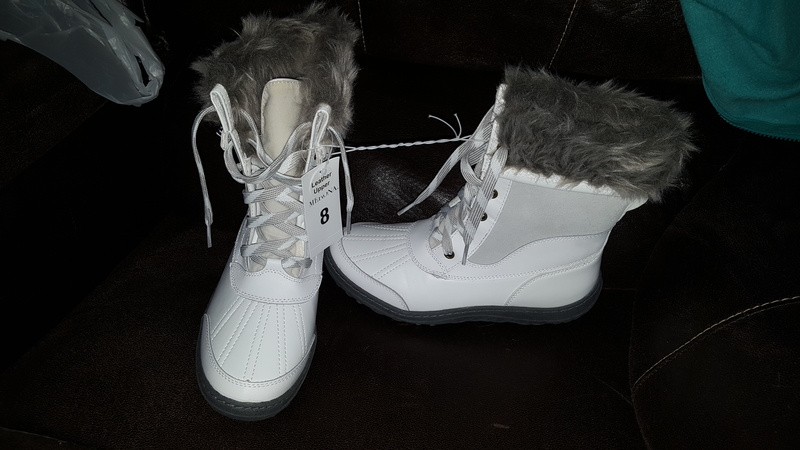 Tis The Season… for boots! We purchased Mini her boots for winter and guess what? They are a WOMEN’S SIZE 8!!! Yup, we are in adult sizes now. Shoe shopping just got a bit more expensive! Tis The Season… for fancy neckware and Christmas-card-worthy pics! 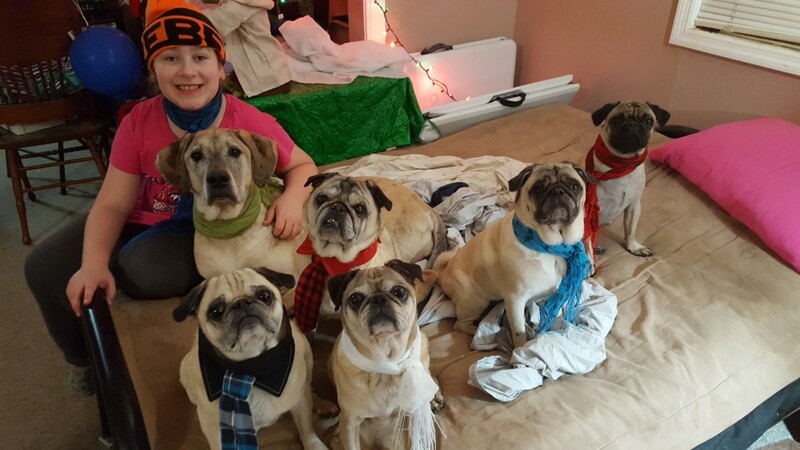 The boys are wearing some ties we found at Five Below and the girls are all sporting some scarves we found at AC Moore. 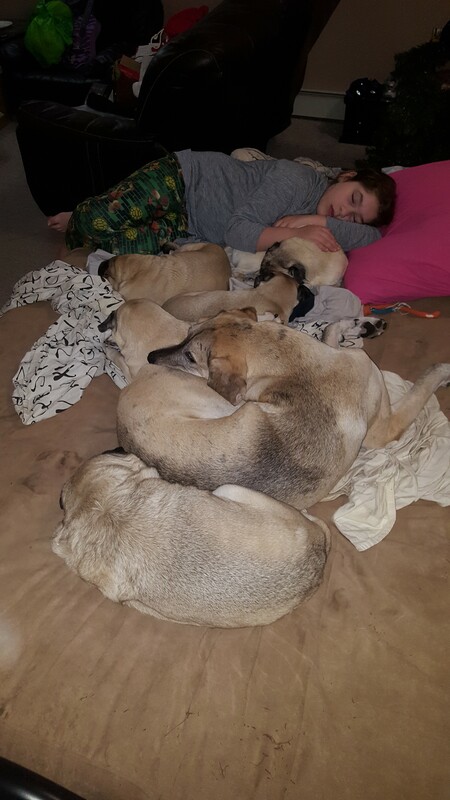 Yes, we pretty much deserve a medal for being able to get the dogs to look at us. The secret is to hold a treat right in front of the camera for the dogs to stare at and tell your (wo)mancub to look at the camera and don’t blink! HAHA! 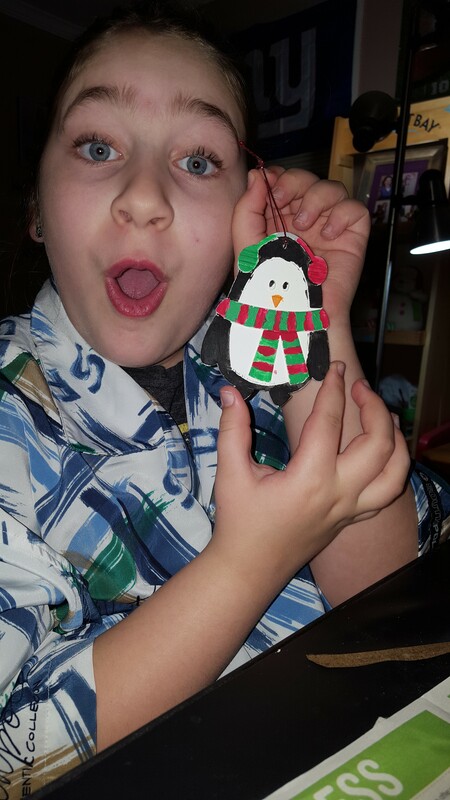 Tis The Season… to paint ornaments! Mini was a bit bored one day so we dug these out of our craft closet, found some paint and VOILA! Ok, so there are my five. I have three bonus pics for this challenge. Tis The Season… for jingle bells! This is Biggie, one of our foster cats. 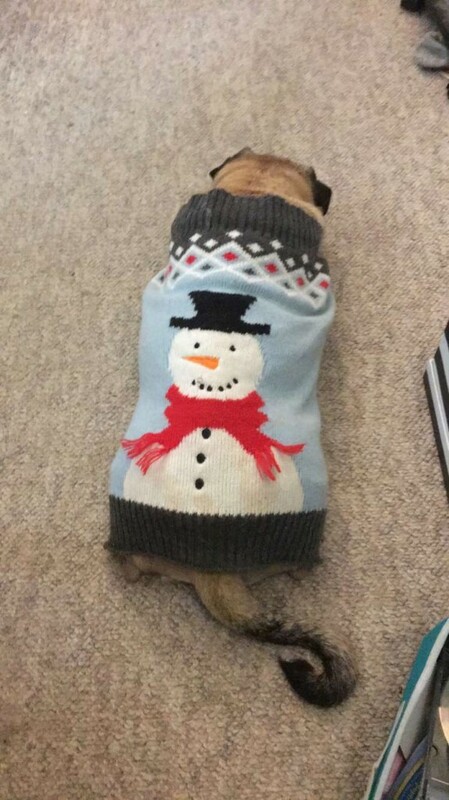 We put the collar on him as a joke. 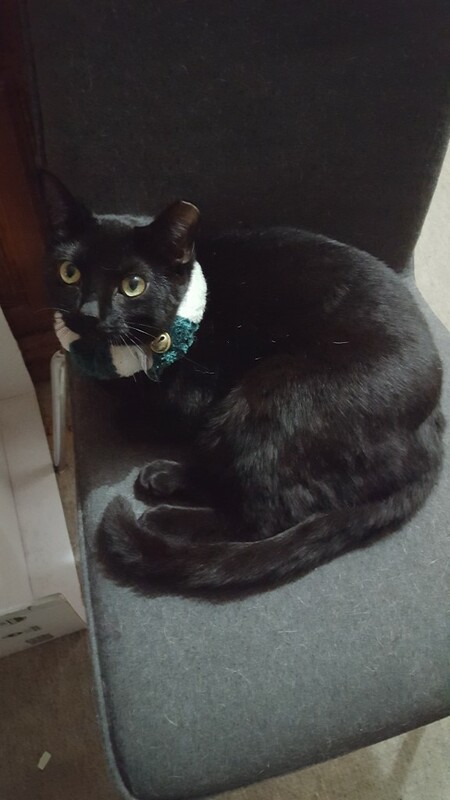 He loved it so much that when I tried to take it off him, he hissed and took a swipe at me until I put it back on. Ok then, kitty. Sorry this pic is a bit blurry. I couldn’t stop laughing as I was taking it! Tis The Season… for cuddling with loved ones, resting up for holiday festivities! Tis The Season… for sales on Build-A-Bear bears and it’s always the season for Star Trek anything! 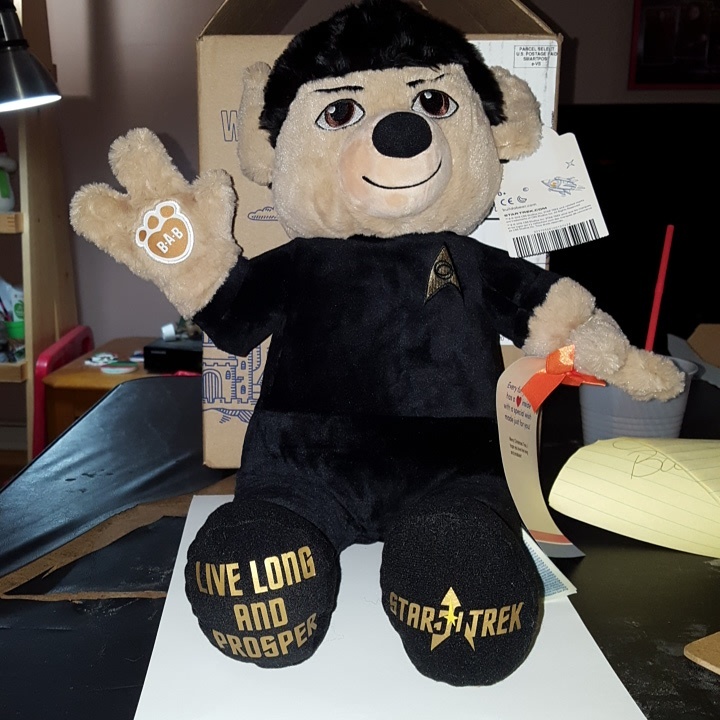 Meet our newest addition, Live Long and ProspBear! I love doing these photo challenges. 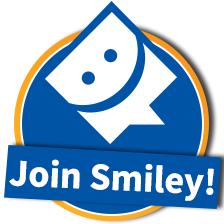 If you’d like to link up, check out the challenge HERE. Terrific! That must have been one heck of a doggie treat to get them all looking at the camera. Well done and Happy New Year to you!